Lori Joyce has made an amazingly uplifting and empowering film about women all over the world (Kenya, S. Bronx, India, Pakistan, Denver, Ecuador, etc.) healing the earth and thereby also healing their families, communities, the whole planet! The women are shown planting trees in Kenya to raise the underground water levels so they can plant crops. In India, they send women to go to the Barefoot College to learn solar so they can return home and create solar lights in poor rural villages. In the South Bronx, a woman transformed a dump to a beautiful, safe park for children to play in. Urban farming in Denver, and lots more. This film is a MUST SEE!!! 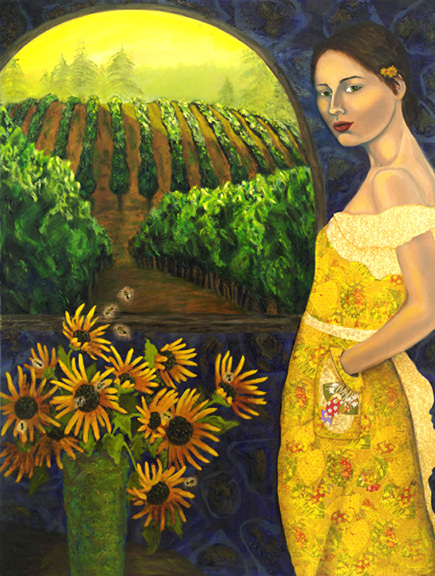 I am humbled and honored that Lori contacted me and asked to have my painting, Sunflower Days, in this film.